When I'm not pushing pixels or cranking out code, I can be caught cycling, hockeying and doing general dad stuff. Front-end development for Jefferson Health's Sidney Kimmel Cancer Center website re-design. Responsible for features including responsive css, jQuery components, svg animation and CMS integration with AEM (Adobe Experience Manager). 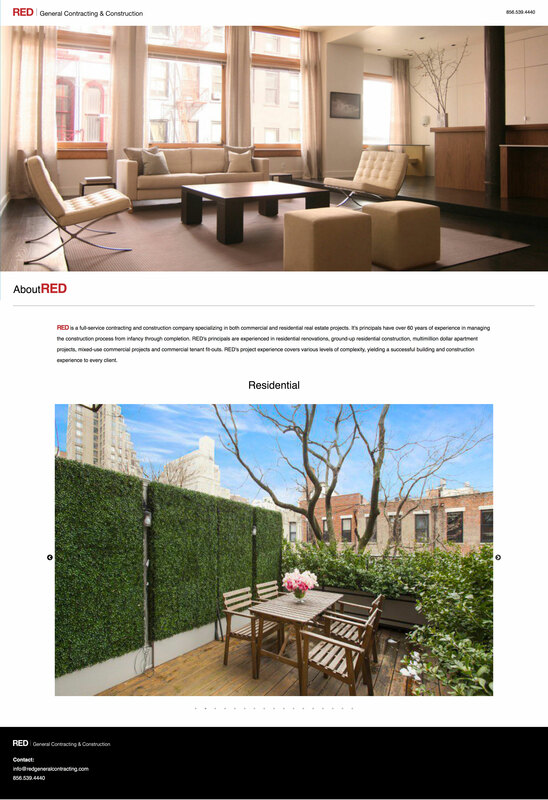 Landing page for RED, a construction group specializing in corporate and residential development. Part of the Jefferson Health Digital Innovation & Consumer Experience group, (DICE). Responsible for front-end development tasks including the Sydney Kimmel Cancer Center website redesign using current development coding standards, front-end frameworks such as Bootstrap 4 and content management via AEM (Adobe Experience Manager). Created peer-informational course series highlighting accessibility compliance for web design. Initiation of on-boarding mentoring efforts to improve and encourage new employee acclimation, engagement and growth. Responsible for front-end development tasks in a fast-paced and ever-changing sports retail domain. Worked as part of the development team for major e-commerce clients such as: NFL shop, NBA store, NHL and MLB shop. Frequent collaboration with designers and business leads to support an enhanced online shopping experience. Supported the migration of dozens of websites to a new responsive platform, helping to serve more potential customers and increase overall profit margin. Responsible for the creation of info-graphics, web-based advertisements, branding conceptualization and standardization, with a digital-marketing agency focused on target-market research and brand development. Responsibilities within the collateral management product division ranging from front-end development and UI/UX design, to maintaining client branding standards. Also involved in the creation of graphical process models to visually convey application semantics such as: user interaction, functionality, security protocol, etc. Responsible for interactive design and authoring for various e-learning platforms, focusing on the development of intelligent and intuitive UI to better serve client training goals. Web development and UI design in a fast-paced, demanding agency environment. Specializing in client brand management, cost-effective marketing and rapid product delivery. User interface design and development of e-learning applications utilizing various design tools ranging from creative suite, to 3D design. Maintenance of branding standards for clients including: Black & Decker, Home Depot, Exelon Energy and University of Pennsylvania Health Systems.